A diluted base color occurs when melanocytes produce less pigment or when less pigment is stored in the hair. Research has shown that “Dun” was the initial coat color of all horses. This phenotype consists of a diluted base coat color and primitive markings on the back and legs (dorsal stripe, zebra stripes). It is thought that this color may have evolved for better camouflage. Since then, two so called “non-dun” mutations have occured, which allow the pigment to be more normally distributed into hairs, retaining (nd1) or not retaining (nd2) the primitive markings. Selective breeding lead to the predominance of fully pigmented horses in most breeds today. Not only duns display a diluted coat color. Multiple mutations have been identified that cause a wide range of different coat colors, shades and dilutions. This includes the widely spread Cream dilution. Others include Silver, Pearl and Champagne. Depending upon the manifestation of the dilution, it can be difficult to identify the base color in some horses; for example, a silver bay horse may look like a chesnut to the untrained eye. Buckskins (bay with the Cream dilution) may be mistaken for duns (particularly if they have a non-dun 1 mutation and retain primitive markings – these horses may be referred to as “Pseudo Duns“). In case of doubt, genetic testing will identify base color and dilution factor. 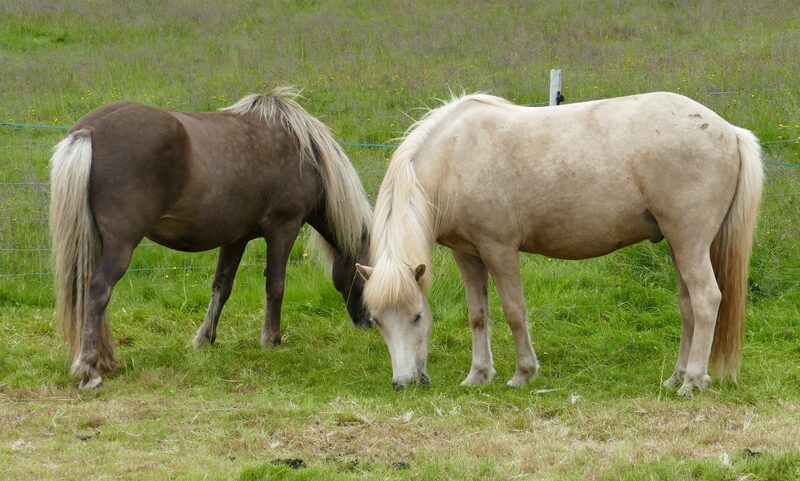 The “Mushroom” dilution is seen in some Shetland ponies, but the causitive mutation has not yet been identified.